There are 69 reviews of Dune. Dune may intend to conjure up sandy mounds and ocean air blowing over a garden of herbs, but in reality it's a transparent oriental with immeasurable radiance. The drydown, which really is what Dune is all about, is peppered with patchouli, sandalwood, and vanilla. If your bottle is old enough, you may even get some of those notes composed with natural materials. What makes all of these notes meld together, though, is a huge slug of orris, which adds a dry, austere feeling and lightens the weight of these heavy materials. A genius, outstandingly original masterpiece. Dark, pensive, and something I could never live without. Note - the EDT is my favourite, showcasing more of a diverse note list. The extrait is more dense and focused on the drydown. The alcohol-free summer spray is an unpleasant concoction with only minor nod to the real thing. I've not yet tried the esprrit de parfum. At the time of release, Dune had a ton of promo items like broaches, earrings, bracelets and the lot. You'll come across them at high prices, but I assure you, they are not fine jewelry and shouldn't be purchased as such. From a vintage sample... Some aldehydes on top. Not too much. A touch of greenish-floral with some wood. The middle seemed dark and moody with sort of a waxy flower smell - jasmine, ylang, and rose were almost dirty; damp, like after a rain. Lovely base where I smell sandalwood, amber, a touch of patchouli, and an oakmoss-y accord. 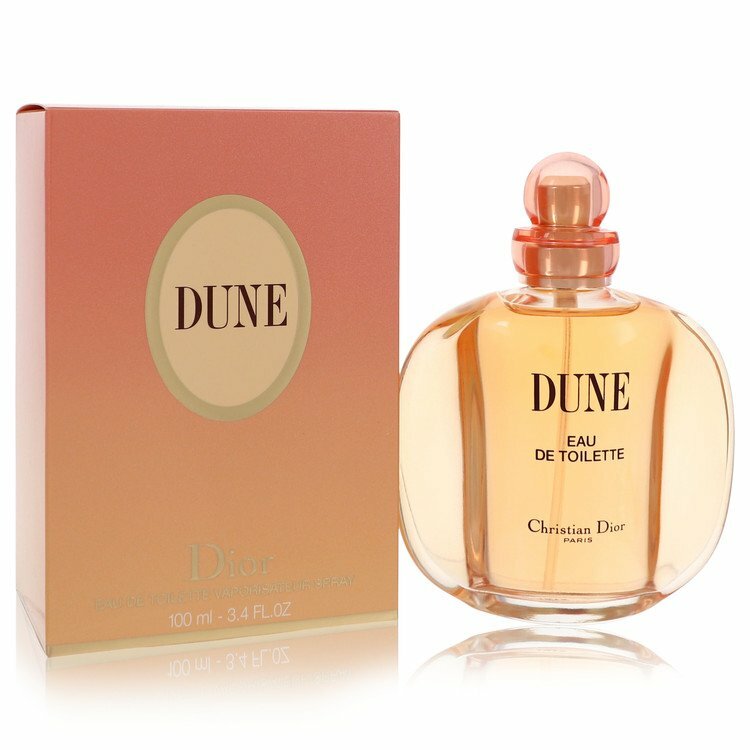 Dune is a safe fragrance; only a tiny bit daring. 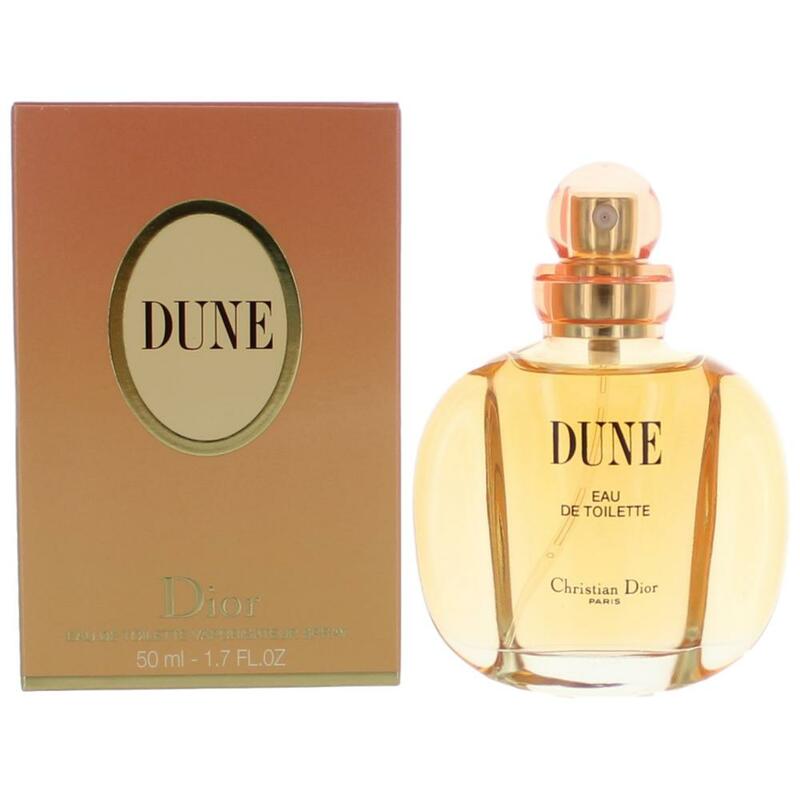 I tested Dune without much expectation. The woody opening smells just like how I remembered it while someone in my family wore it during my teenage years. Then, what a surprise when I sniffed my wrist a while later! The amber blended with benzoin, lily, jasmin and other flowers is such a pleasant scent, so smooth and comforting. I detect somehow a slight salty/sour/bitter/whatever note providing a tiny dry twist. The sandalwood lingers somewhere in drydown and slightly spices up, providing a deeper dimension. I don't get the beach/desert image as previous reviewers. But it definitely gives me a earthy feeling, like I was embraced by the mother earth. And the sillage and the longevity is pretty impressive for an EDT. The only thing that I'm not so happy with is that I don't get the ethestics of the bottle. Otherwise, I'd definitely recommend this sensual fragrance. Boozy and powdery, with a lot of peony... Dune is getting a very vintage feel now. Wearing it now is very empowering, very classy. I love it as much as I hated it. And I hate that I'm saying that. Recently bought this again out of nostalgia; wore it when it first came out in 1991 and remember getting some great compliments when I'd wear it. I don't know if it's because of my body chemistry or lame nose, but I don't recognize any floral notes at all. It's always a rich blend of amber, musk and woody notes, with a touch of the bergamot & mandarin for a delicate reading of citrus. I don't mind at all -- when I want rose, peony, etc. I've got other fragrances to wear. 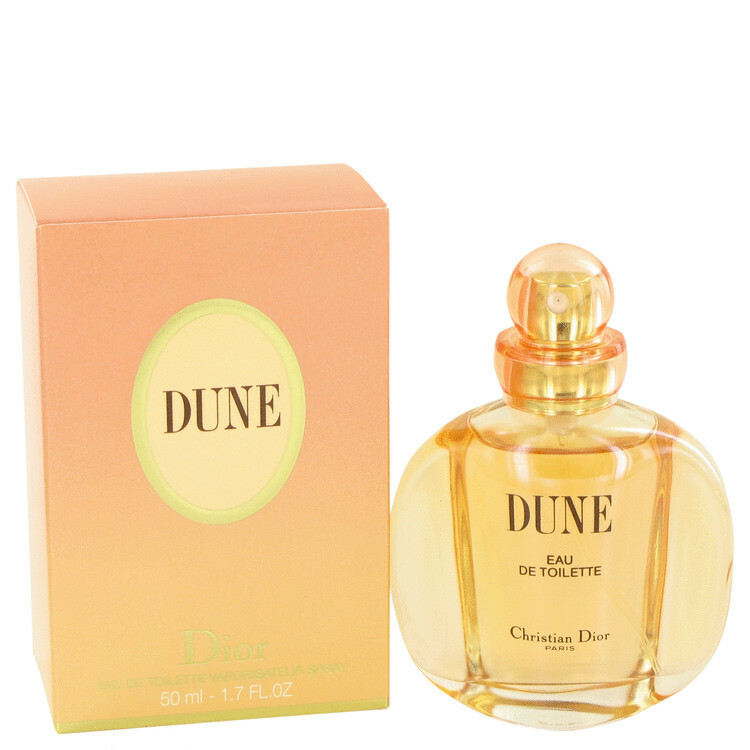 But when I wear Dune it's because I want the warm, soft yumminess of amber. So glad I have this back in my fragrance wardrobe! A warm embrace between freshness and strength,DUNE emanates a feeling of balance and serenity.Every man I've known loved it on ladies.It is an exotic fragrance,not too heavy and not too light,just the perfect blend for every season.Classic,Sweet, Elegance,Radiant,Ladylike and Appealing. Right top notes of bergamot and peony rest over a soft and feminine bouquet of floral notes while the sweetness of the base notes due of vanilla and especially amber makes you feel like a breath of sunshine.It is a beach party for the senses. 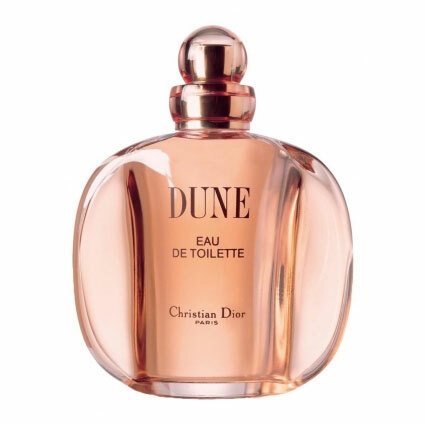 It does not scream for attention.In fact if you like amber,you'll love this scent.DUNE is suitable for any age and any occasion.Totally it is not the best female perfumes by DIOR or the better than male version but this EDT is really lovely and interesting for me. Longevity?preponderant than a EDT on my skin.DIOR is always interminable. There are no member images of Dune yet. Why not be the first?